When I make salads, I prefer a no-oil dressing. I grew up long before the days of bottled salad dressing and olive oil. If we dressed salads at all, it was with vinegar. I remember my grandmother making salad by sprinkling a teaspoon of sugar, salt and pepper over the salad and then pouring in some vinegar. By the time the salad was eaten, the dressing was a mix of tomato, cucumber and onion juices mixed in with the vinegar and sugar. Grandma drank it straight down and taught the habit to my sister, Tricia. I drink it now too and have discovered there is nothing quite as bracing as a mouth full of vinegar juices. I often have flavoured vinegar in the cupboard. I make it up ahead of time so it can develop flavour and add extra depth to potato salad, coleslaw, fish and quick pickles. If you add two tablespoons of this vinegar to mayonnaise, it cuts the creaminess back nicely and gives it a little kick. 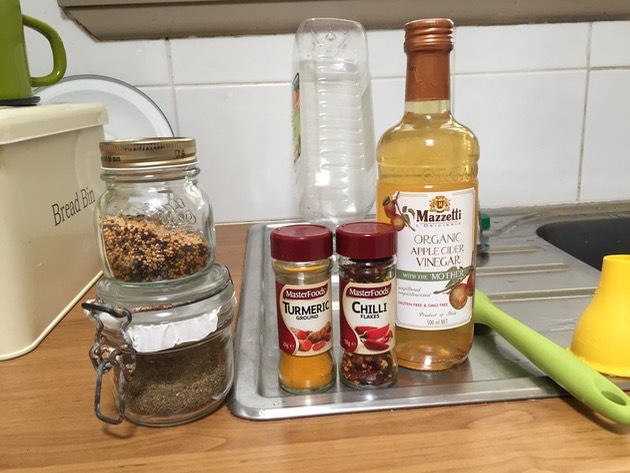 I've been using flavoured malt vinegar recently so I decided on an apple cider vinegar this time. It's a simple process that takes less than five minutes. All I do is place vinegar, sugar and spices in a saucepan and bring it up to a hot, but not boiling, temperature. 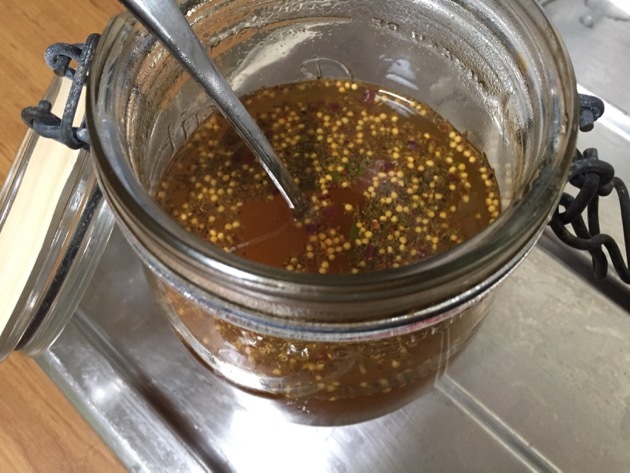 You can use any spices you fancy, I tend to use the traditional pickling spices of mustard seed - I have yellow and black here, celery seeds, pepper, chilli flakes and salt. I used two small fresh bay leaves too. I'm not giving you any set amounts because this is one of those things where you throw the recipe out the window and rely on your own taste to guide you. When it tastes right, it's right. 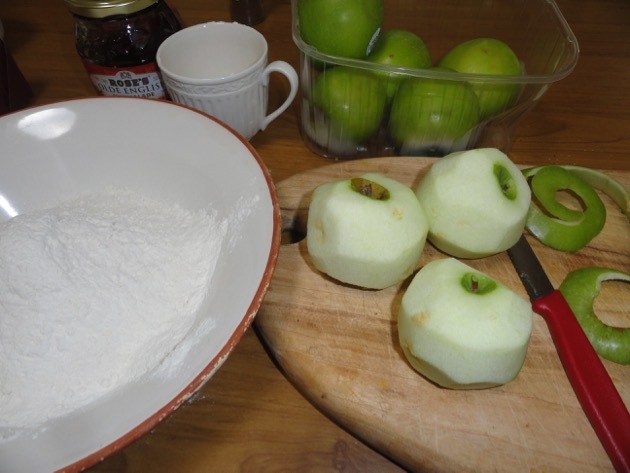 But as a little hint, I used 400 mls of cider vinegar and ½ cup raw sugar. 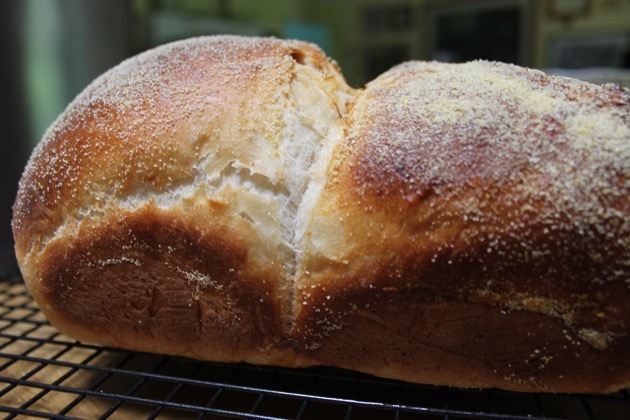 If the taste is too sharp and it's already sweet enough, add a little water to mellow it. When you have the base liquid to your taste, start adding the spices you like. 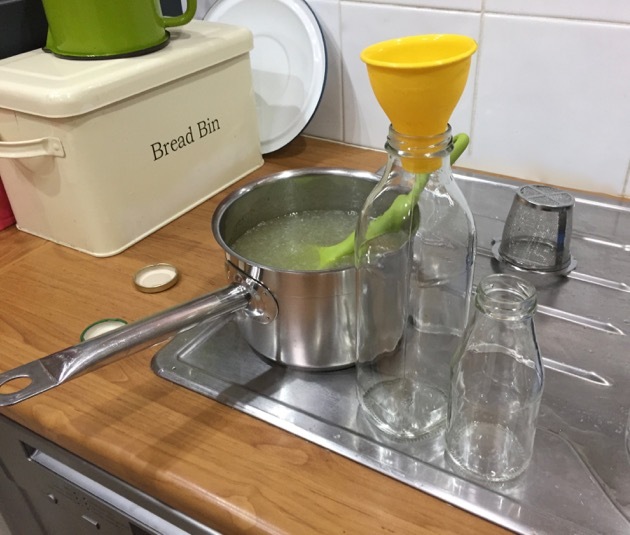 White vinegar will result in a clear liquid, cider vinegar will go cloudy. Pour it into a jar while it's still hot and let it sit on the bench while it cools. Stir it occasionally to bring in the flavour of the spices even more. 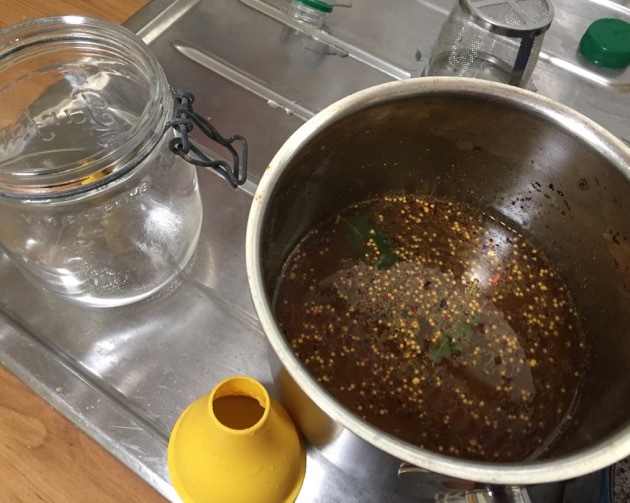 If you don't like the floating seeds in the vinegar, strain them out after a couple of days when the flavours have completely developed. I always store this in the fridge. I'm not sure of the acidity level of the vinegar, it needs to be 5% to be stable in a cupboard, so it's safer in the fridge. 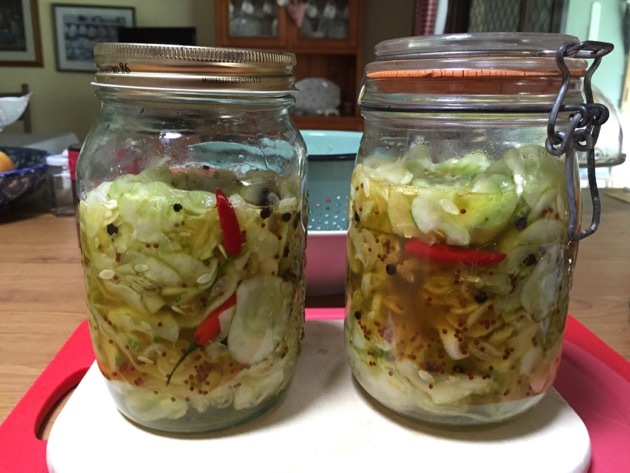 A great use for this is to do a quick pickled cucumber. 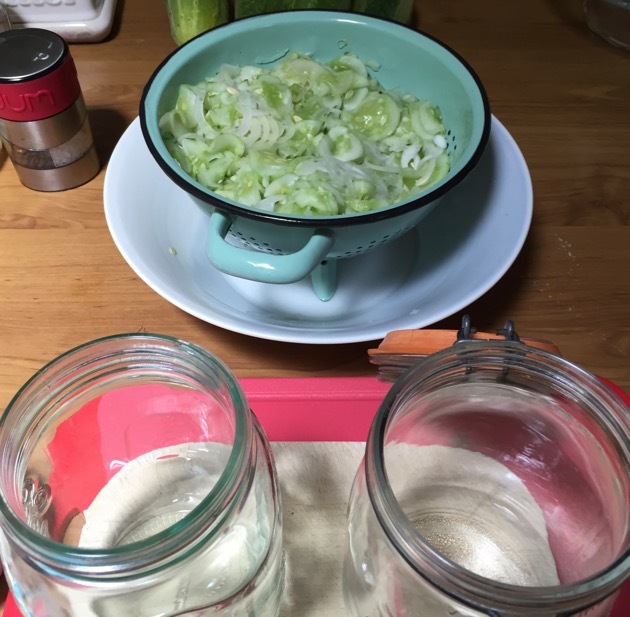 Three to fours hours before using it, slice cucumber and some onion and place in a bowl. Sprinkle over about a tablespoon of salt and let the cucumbers sit for 45 minutes. This draws water from the vegetables so you don't get watered down vinegar when you fill the jars. Wash the salt off before placing the cucumbers in a jar. Pour over just enough vinegar to cover the slices and allow it to sit until you use them. We're still working our way through the citrus. The orange tree has been picked, we have a jug of fresh orange juice in the fridge and the last bucket of oranges waiting to juiced. There are still a lot of lemons on the trees and I had about 1500 mls of lemon juice in the fridge waiting to be used. 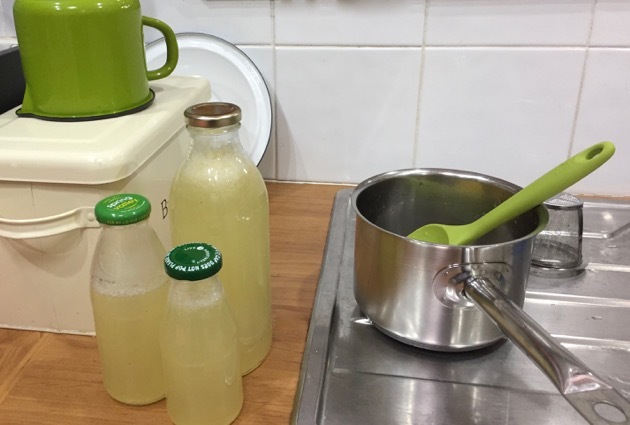 I made more 100ml portions of lemon juice ice blocks and used the rest of the juice I had to make a small amount of lemon cordial. It will give us a nice boost of vitamin C over winter. This is my usual recipe for cordial. It's delicious made up as a cold drink but you can also add it to hot black tea in winter. 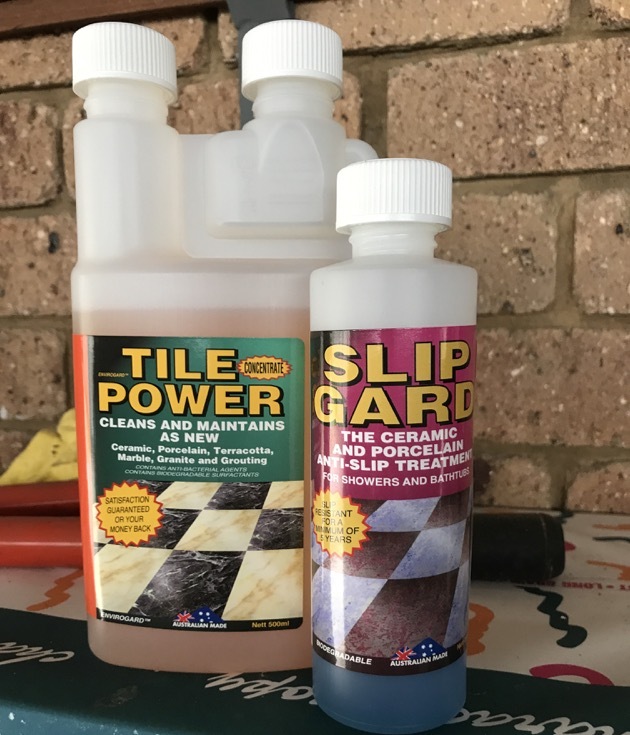 Such simple liquids, but they both transform any food they're added to. Do you have a favourite vinegar or juice recipe? 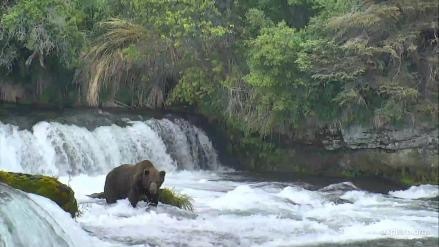 If you were reading here last year or the year before, you'll probably remember how I became hooked on watching brown bears live streaming from Brooks Falls in Alaska's Katmai National Park. It was fascinating viewing and, I believe, a true privilege to be able to watch wild animals living side by side in their natural habitat so far away. I took these two photos this morning. As with most things we find joy in, bear watching comes in fairly small doses and in October/November the bears start climbing nearby Dumpling Mountain to hibernate over winter. When they make that climb, they're in top condition with enough fat and nutrition to see them through months with no food. They came back this week and the past couple of days Jamie and I have been catching glimpses of the bears as they return to Brooks Falls. They're not there all the time but soon they will be. 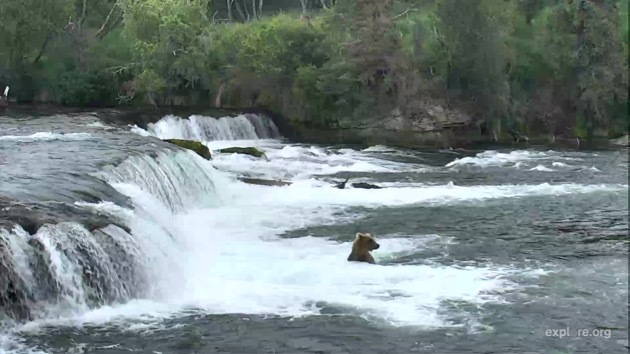 The bears are drawn to the falls by hundreds of thousands of sockeye salmon as they swim up stream to spawn. 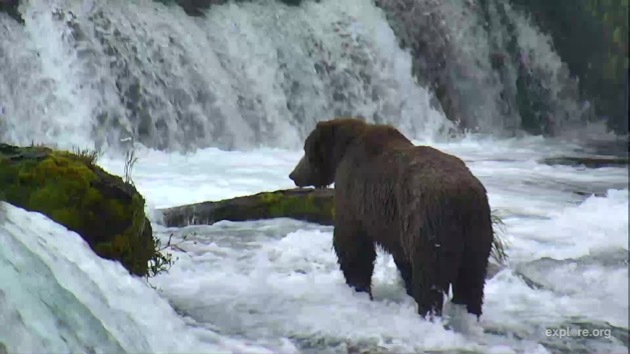 The cycle replays every year - the salmon return to reproduce and as they swim upstream to do that, many become weak, the bears get their fill of high value food, the salmon eventually reach their destination, spawn, die and float back down river where the bears and gulls tidy up, fuelling their bodies for the coming winter. This photo was taken late last year. There is only one camera operating at the moment, and there will be four soon, but even with one camera it's something you should see. It's a rare sight seeing those huge bears scrambling after fish, swimming, establishing their place in the hierarchy, and living alongside other wild creatures such as wolves and the ever-present seagulls. July is the peak bear watching month but there are already a few small bears at the falls, along with a mother with three cubs. 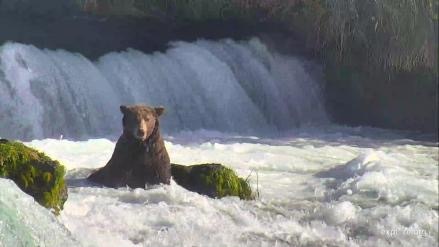 Every week from now on we'll see an increase in the number of bears feeding at the falls. 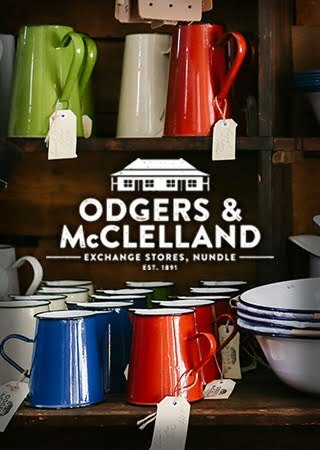 If you get a chance, have a look. Like me, you'll probably be amazed at how we can sit in our homes while watching these beautiful animals, live out there, living in the wilderness. This little fellow is at the falls now. It's 5.30pm there and the bears will continue feeding until midnight. My sincere thanks to everyone who left a comment on the previous post about how they reduce their household waste. There were many excellent ideas that I know will help others work on this important aspect of home management. 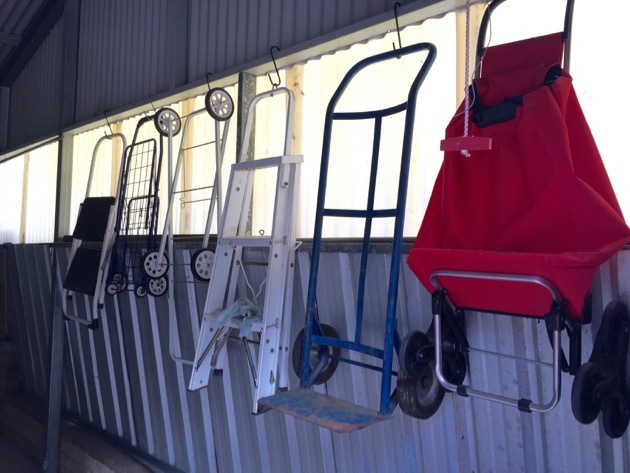 Soon there will be other posts dealing with the waste issue and I hope we have your continued involvement as we build up a resource for everyone to refer to. 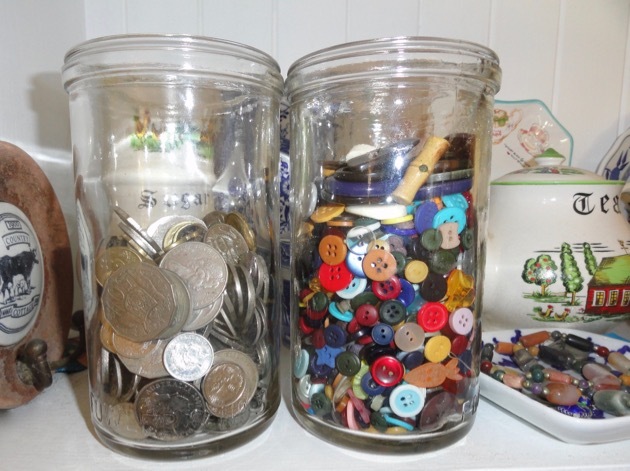 Since watching the ABC's War on Waste, I've realised that a lot of us don't know how serious the waste problem is and now I'm wondering if there is something we can do about it here on the blog. I want it to be a collaborative effort, something that involves pooling our knowledge so we can all work towards minimising waste. We should all be doing something, even if it one thing. Doing nothing isn't an option anymore. I'll start with this idea and see how we go with it. Hopefully, with the combined knowledge here, we can identify common, home-based waste problems and together, build a list of potential solutions. 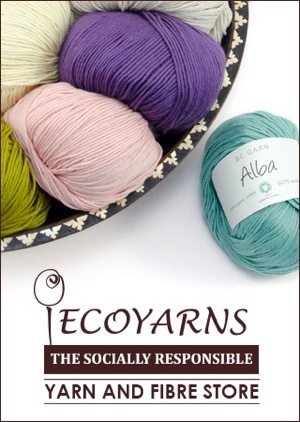 I'll list each of these posts under the label War on Waste. I want us to create a useful and intelligent resource we can all return to regularly for information and motivation. The first problem to tackle is food waste, it's something we all deal with. I'll tell you what works well for us here, then, in the comments, you tell us what you're doing in your home to stop wasting food. Please, only contribute your tried and tested methods, something you do that works well and that others may try in their own homes. The big thing here in my kitchen is the bag clip. 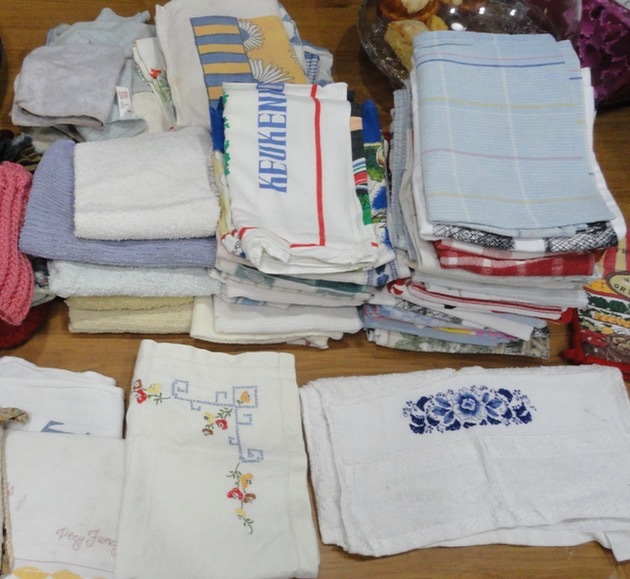 I blogged about these when I discovered them (years after everyone else) about 12 months ago. They're still working well and helping us save a lot of food. 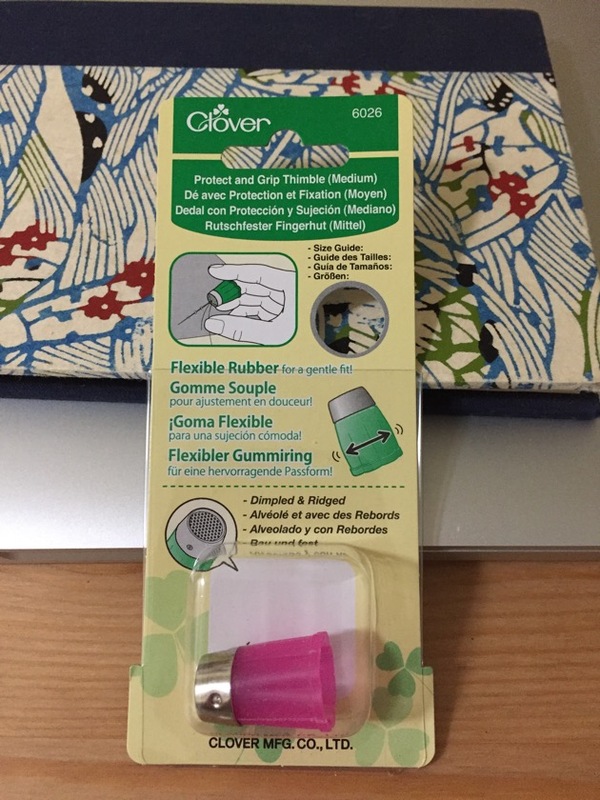 If I put vegetables such as lettuce, cauliflower, broccoli, radishes etc into an air tight plastic bag sealed with one of these clips, the food lasts at least twice as long as it does sitting in the crisper in the fridge. It's such an easy thing to do, I wash the vegetables first, shake off the excess water, then put it in the bag and clip it. Then it goes into the crisper drawer. 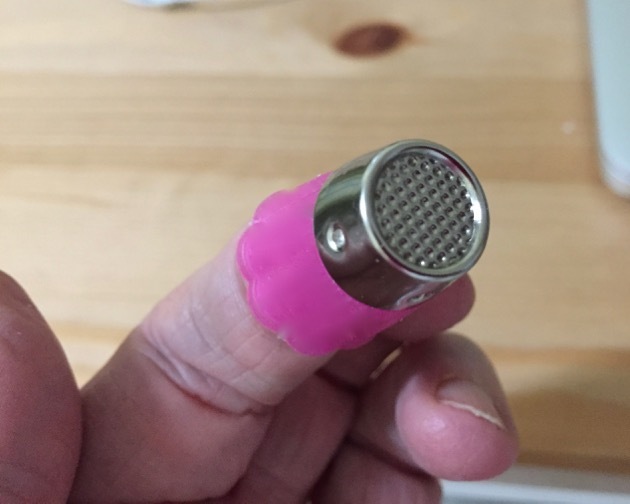 When I get it out, sometimes two weeks later, it's still crisp and lovely. Handy hint: you can wash the plastic bags quite a few times before they have to be disposed of. Keep them going until they develop a split or a hole. Make sure to harvest your home grown vegetables before they start wasting away in the garden. 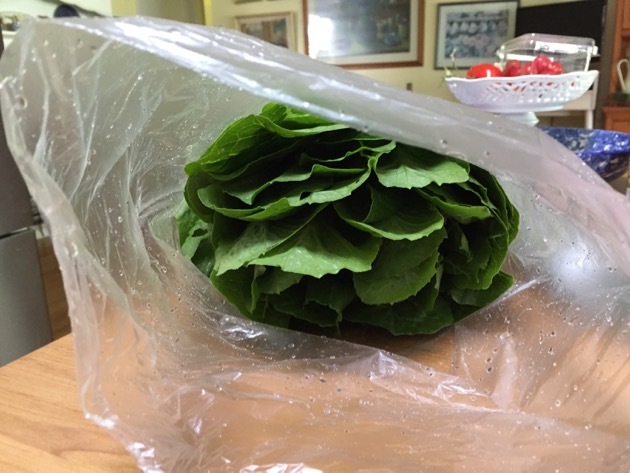 One fresh lettuce in a clipped plastic bag in the fridge will see you through a few salads and when it's coming to an end, harvest another fresh lettuce and bring it inside. Here are the amazing clips - a black one on the cauliflower, a white one on the lettuce. A wonderful low tech solution for storing food, as long as you don't go overboard on the plastic bags. Just a quick word on the food you grow in the backyard. It's a shame to waste any food so work out how you'll manage the vegetables you grow and make sure you stick to that. At the moment in the colder weather, lettuces can stay in the garden for a week or so if your'e not quite ready to use them. 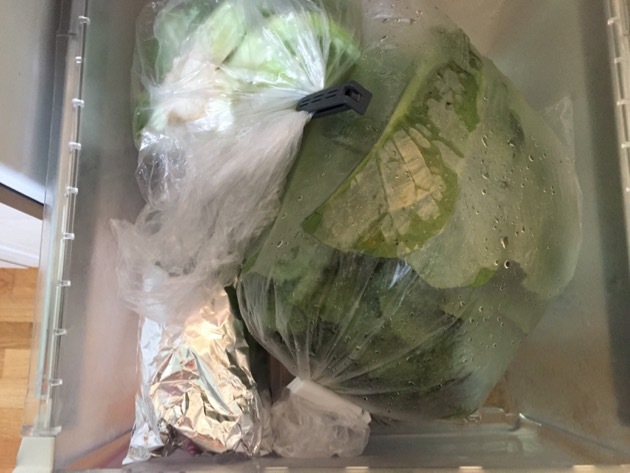 I pick a lettuce, wash it and like my store bought vegetables, store it in a plastic bag with a clip. Vegetables such as peas, beans, silver beet/chard, spinach, carrots can be picked, blanched and frozen. 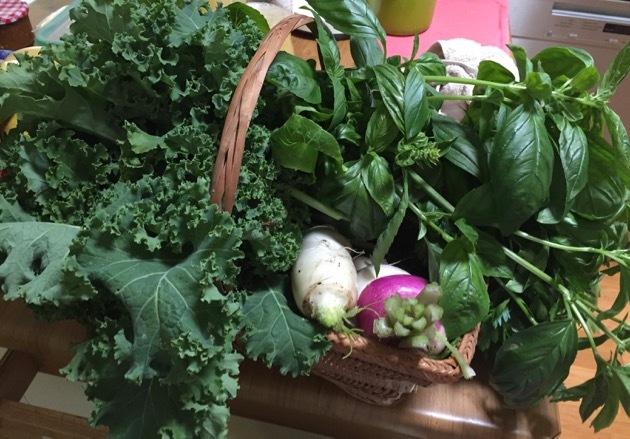 Think about sharing a basket or a bunch with a friend or neighbour if you have more than enough in your garden. Another thing to do is to wrap celery and soft herbs such as parsley, in foil. Again, wash it first, shake off the excess and wrap it well so nothing is poking out. Celery will keep like this for six weeks and still be as crisp as the day you wrapped it. Parsley lasts a couple of weeks. Of course all this depends on how old the vegetable/herb is when you wrap it. Wrapping 6 week old celery that you found for 50 cents at the supermarket will not be saved. 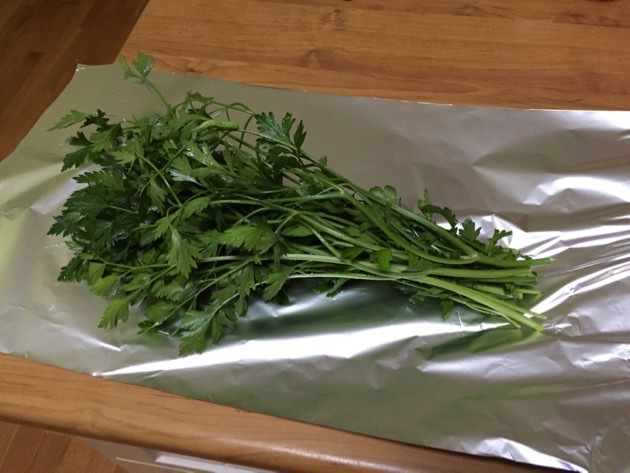 Parsley and some soft herbs can be stored safely in foil. 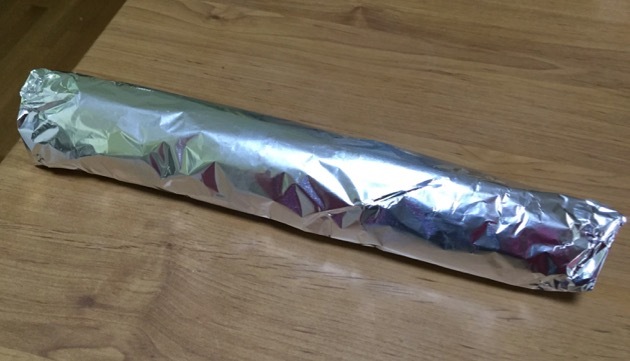 Place the foil parcel in the crisper in your fridge. For citrus - either what you grow or buy, juice it if you think you won't eat it in the next week. 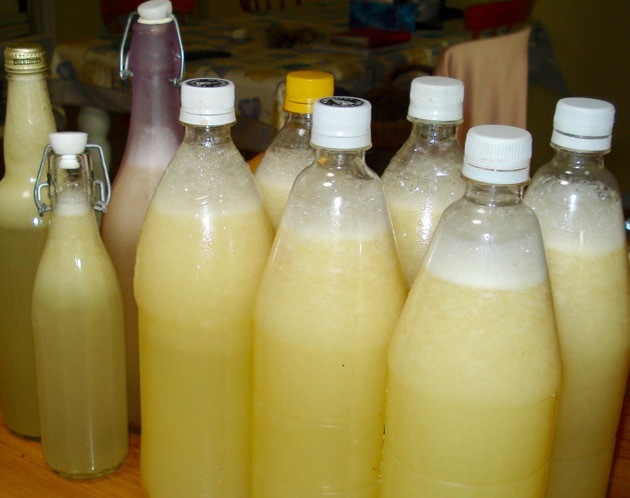 I store our backyard citrus juice in 2 litre bottles for cordial in summer, or as ice blocks for small amounts of lemon juice in my cooking. Either way, juicing works extremely well. 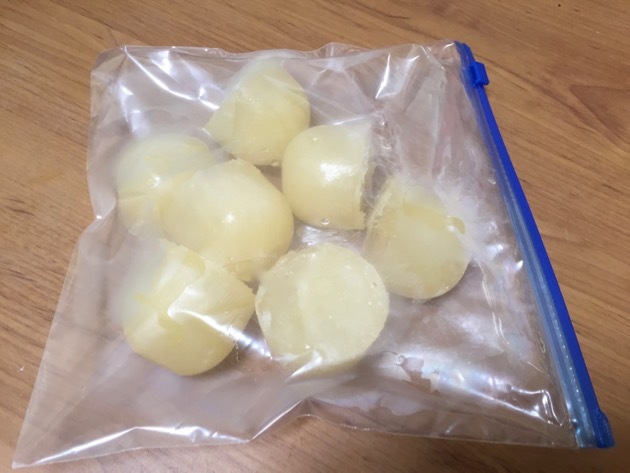 Pure lemon juice ice blocks in 100ml portions for cooking. It's a good idea to plan your shopping list and only buy what you know you'll eat. When you return with a full shopping bag, take the time to deal with the perishable food immediately. Think about how to store each vegetable so it will last in a nutritional state until you eat it. Now it's over to you, my friends. 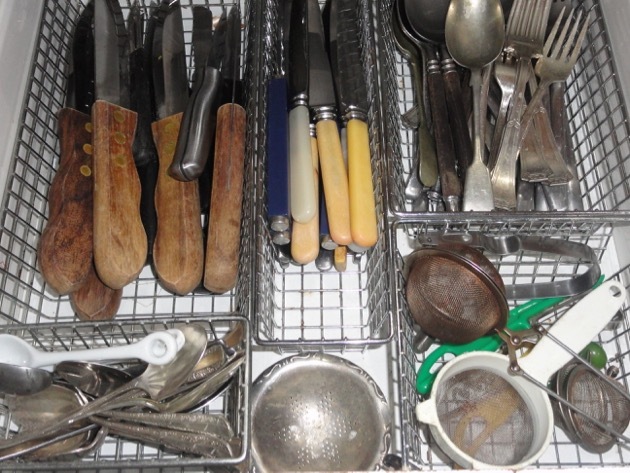 Tell us how you're dealing with food waste in your home. ADDED LATER: There are some fantastic ideas in the comments already. This is what I was hoping for. Thanks to everyone who left a comment. Great work! We're having a fairly mild winter so far with cool to cold nights and warm sunny days. It's ideal gardening weather. How is it where you live? I haven't had much time for gardening this week because I've been writing the notes for my blogging course. Happily, I've finished that now and I'm hoping to get out into the garden this afternoon to tie up some wayward tomatoes and sweet peas and fertilise some of the vegetables. We all work in different ways in our homes. 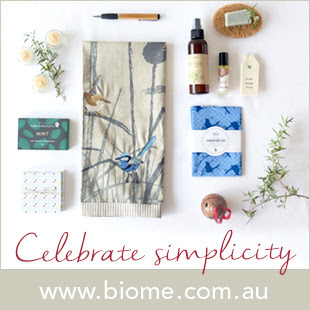 Some of us have babies, children or elders to care for, some produce fresh food in the backyard, there are readers with cows, goats, chooks, ducks, geese and bees, many of us make laundry liquid and soap, we have candle makers, quilt makers and producers who, for necessity or love, make all sorts of things. We also have people who go out to work and who are part-time homemakers, doing their chores after their paid work and on weekends. 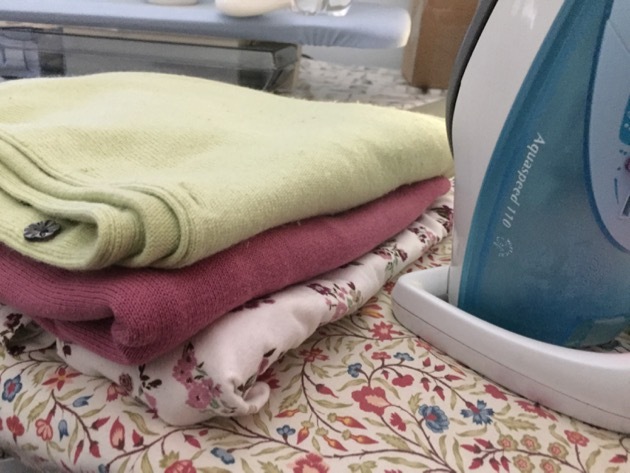 There is no doubt about it, there is always something to do in our homes and homemakers, both full time and part time, are the ones who get things done. 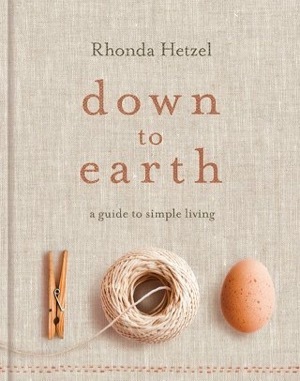 The idea that is sometimes floated in magazines, or gossiped about, that homemakers sit around drinking coffee with their friends or watching TV is laughable. I'm sure there are some women, and men, who do that but it is not the group defined as homemakers. We're busy creating the life we want to live and we do that by working at a thousand different things in our homes. 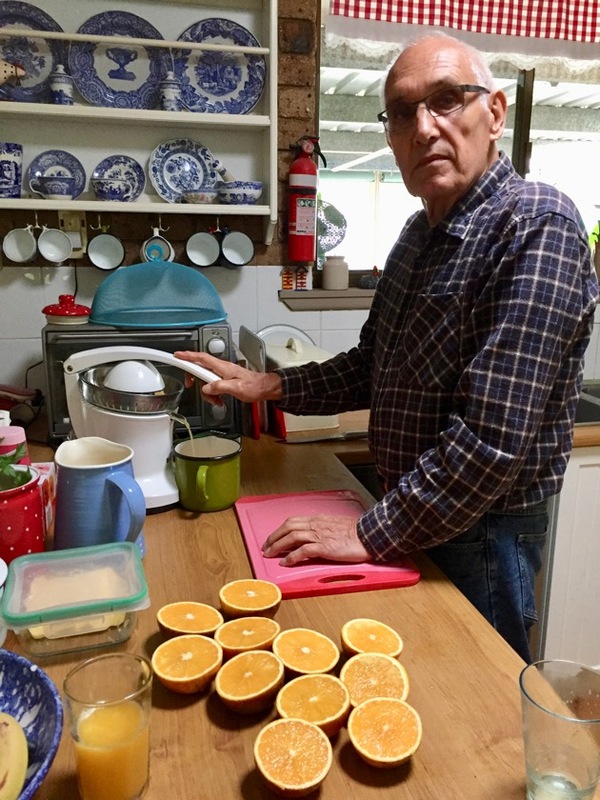 Here at our place, Hanno has been busy harvesting and juicing oranges and lemons. I've been picking herbs so I can freeze them before they die off during winter. We look after grandchildren. Hanno has deep cleaned the chook house and tidied the yard. 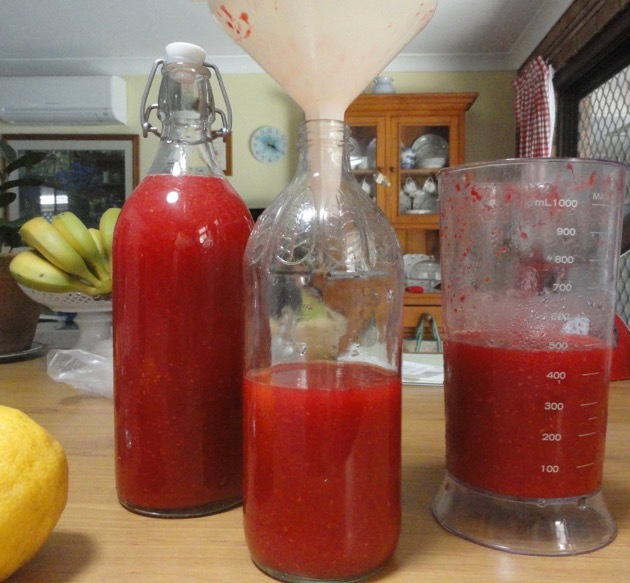 I made up a ten litre batch of laundry liquid a few days ago. 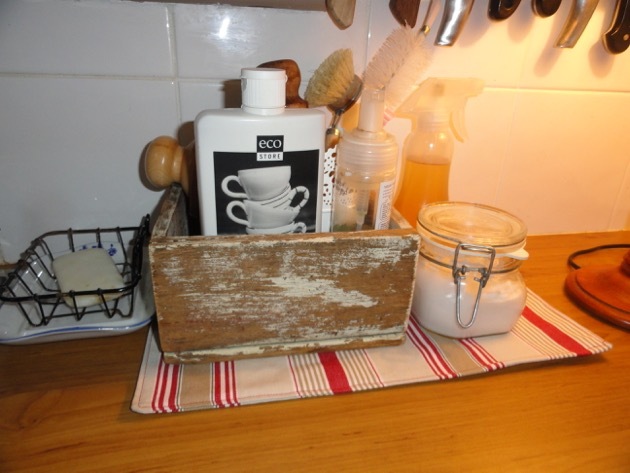 I've sown seeds, cleaned cupboards and washed curtains with Hanno's help. I don't know what we'll do tomorrow, but it will be very similar to what we did today. And yes, we sit down to rest and drink tea, we have conversations about work and life and then we carry on. As I was thinking about all this yesterday, it occurred to me that it is the traditional work that most of us love doing. 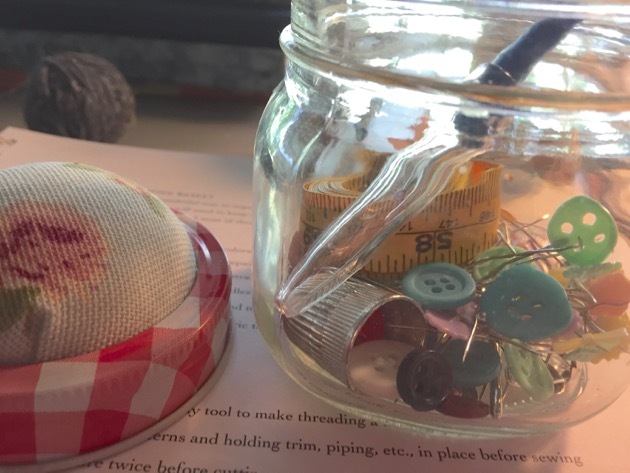 It's the harvesting, the slow cooking of food, the jam making, fermenting, soap making, sewing, mending and reusing, over and over again, what we can. They are our pleasures. If we can do our work using a traditional method, that is what we do. I can't say I've ever thought how wonderful it is to use a tea bag but I love making tea in a pot so that I can pour that properly brewed tea into cups standing on saucers. I've never celebrated paying through the teeth for a bottle of laundry liquid at the supermarket but I adore opening my plastic bucket to scoop our a tiny portion of homemade laundry liquid. Do you know of anyone who looks forward to a store-bought frozen meal heated in the microwave? I don't, but I know many who want to eat the food I cook from scratch. Beautiful handmade soap is such a tender treat and sleeping under a homemade family quilt surely brings the best sleep. It's the keeping of old ways that make these tasks remarkable and significant. We had this for lunch yesterday and it was delicious. 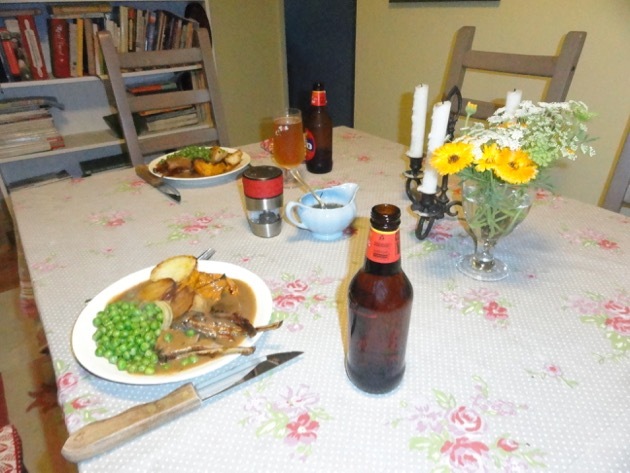 Just to set the scene for you, outside was wet, windy and cold and this meal was an aromatic pleasure that carried on for hours. 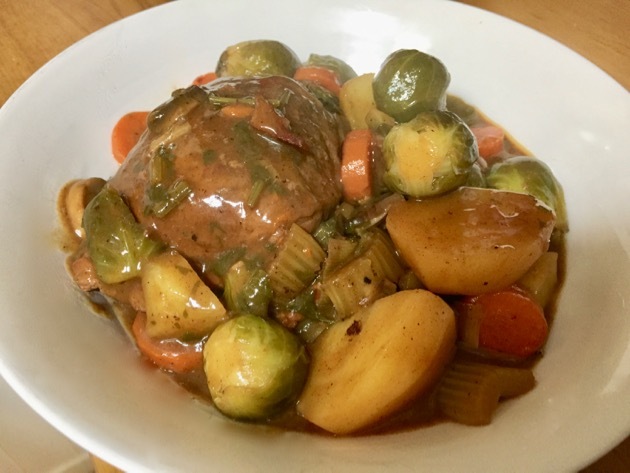 As soon as it started cooking on the stove top, then braising in the oven, the aroma sent out the message: you'll be having a delicious warming lunch soon. If you want to make this recipe, when you buy your meat, don't buy good quality steak. It will dry out and be tasteless. You want a cheaper cut, something like round, blade or skirt steak. 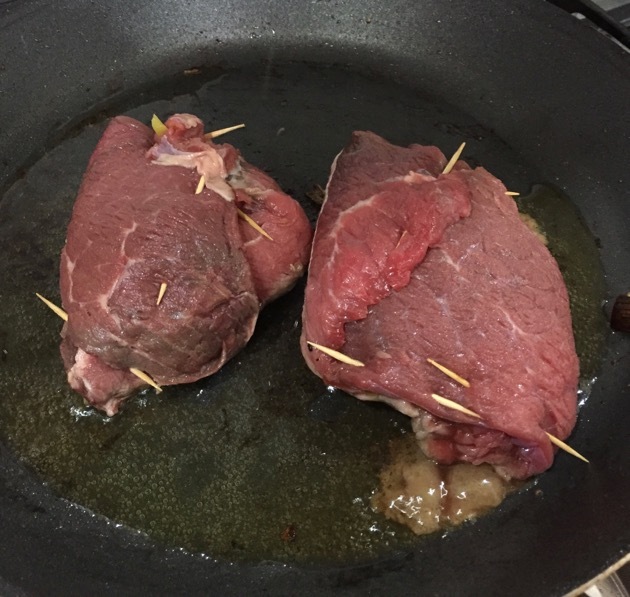 The meal will cook slowly for a couple of hours so even if there is a bit of gristle or sinew in the steak, which is often present in secondary cuts, it will melt during the cooking process and add to the flavour of the dish. 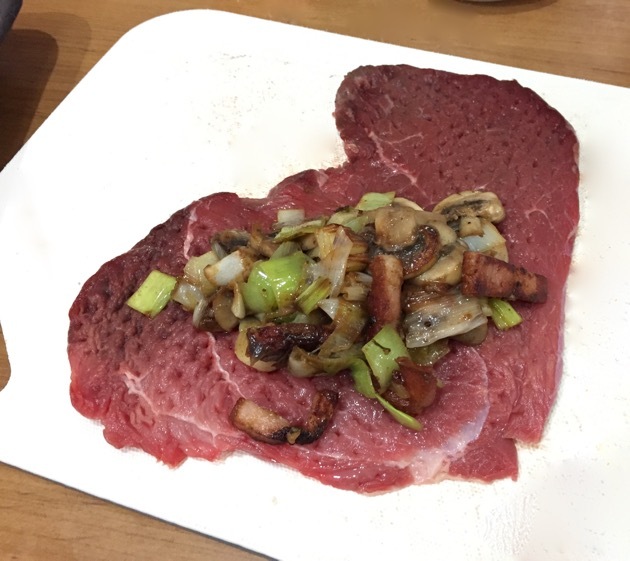 I used two thin pieces of round steak. The vegetables you choose can be whatever you're growing or what's in the fridge. 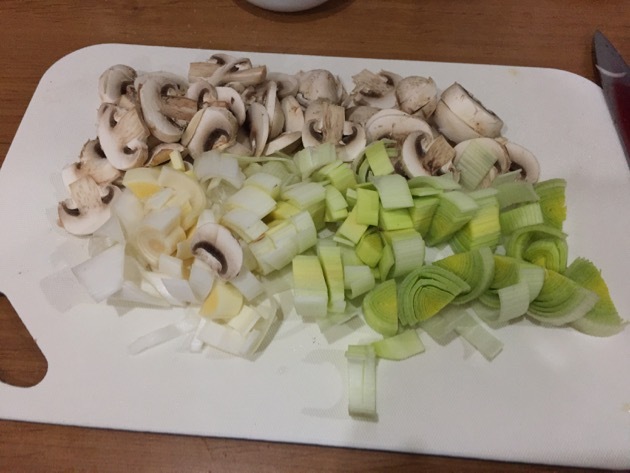 I had some mushrooms and a leek I wanted to use but I started with what I usually start with - onion, carrot and celery. This is commonly known as a mirepoix, which is the flavour base of most European-style casseroles/stews. 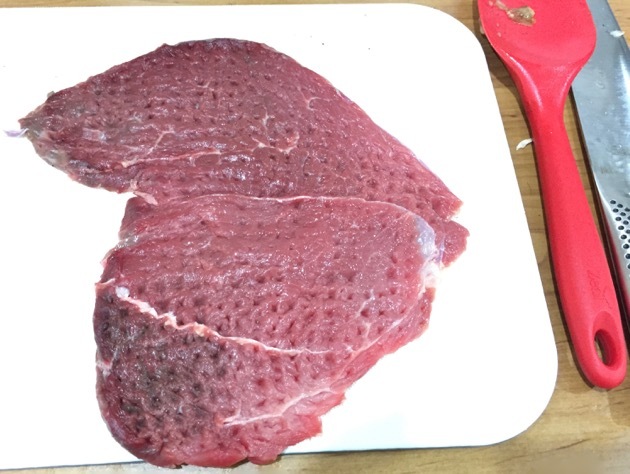 one thin slice of round, skirt or blade steak for each person you're serving. This needs to be thinned out with a meat mallet so all the meat is the same thickness. First, prepare vegetables for the stuffing. 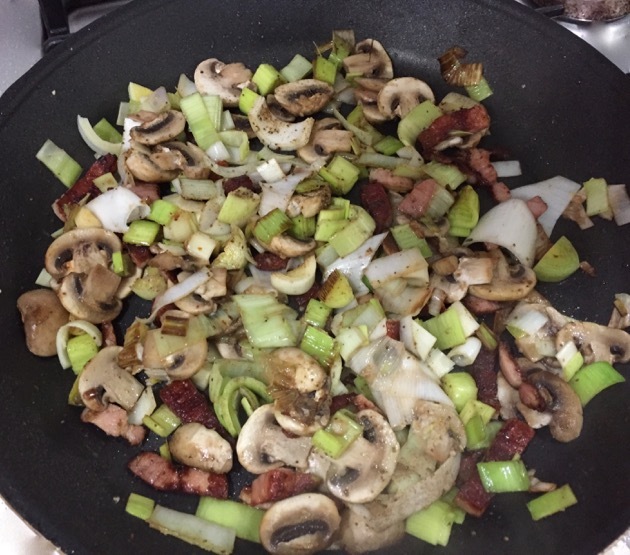 Place into a frying pan with a small splash of olive oil and cook until the speck/bacon is crispy and mushrooms and leeks/onions wilt a little. While the stuffing is cooking, thin all the meat slices. Then place a small amount of stuffing on the meat and fold it so you can secure all sides with toothpicks. 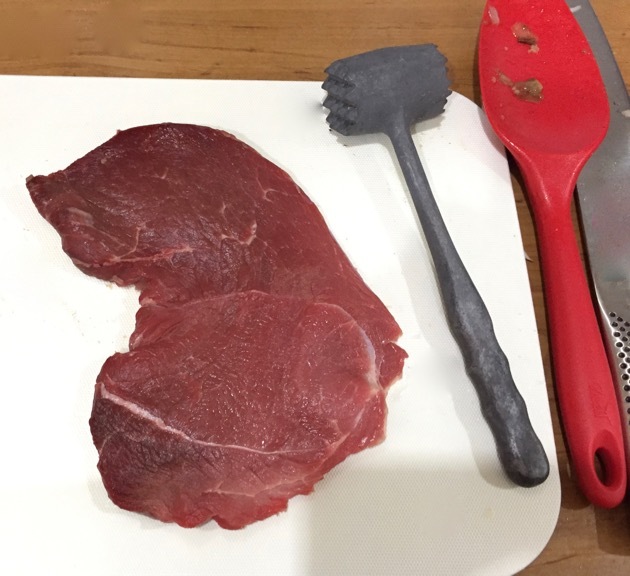 The steak isn't rolled, it's folded so it forms a pocket. 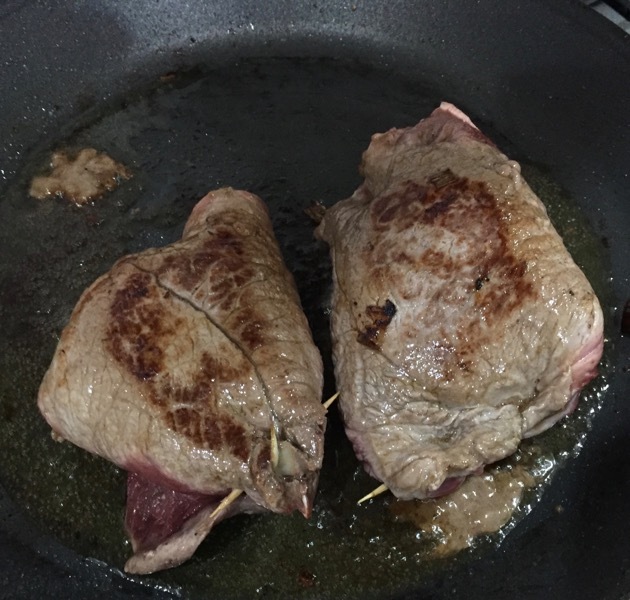 Place the stuffed steaks in the same frying pan you cooked the stuffing in and start browning them on both sides. Don't miss this step because this browning process is where you start building natural flavour in your meal. When the meat is seared on both sides, place it in a casserole dish suitable for slow cooking in the oven. When the frying pan is free again, start your mirepoix. 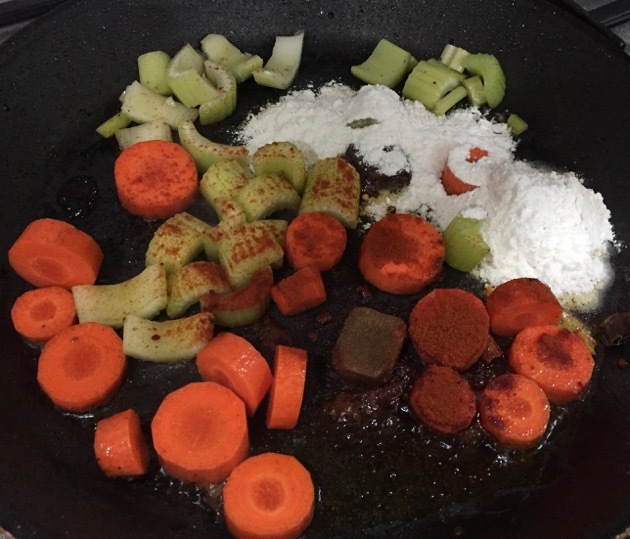 Add chopped carrot, celery and onion (the onion went in after I took the photo), salt and pepper to your taste, two teaspoons of paprika, two tablespoons plain/all purpose flour and cook on medium heat till the vegetables and flour develop some brown colour. Again, this will add natural flavour to your meal. 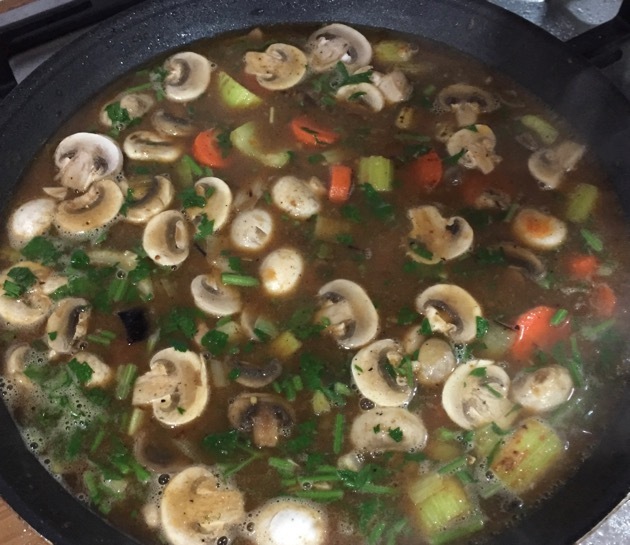 Add the mirepoix mix to the casserole dish, add whatever vegetables you want to add. In addition to the mirepoix, I used the rest of my mushrooms, some chopped herbs and the leftover stuffing. 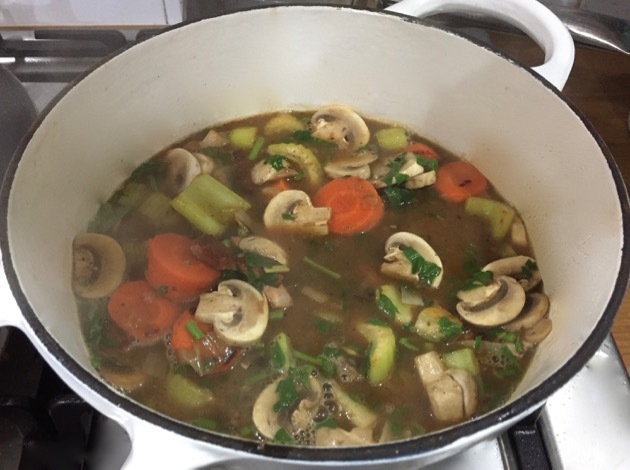 Pour in about one litre of water with a stock cube, or stock. 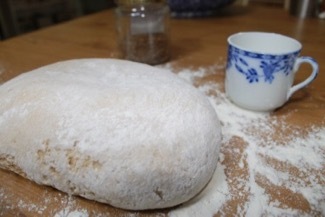 You could also add some Worcester Sauce for added flavour. Heat up the mix on the stove top, put the lid on, then place in a pre-heated oven and cook at 165C/330F for about two hours. 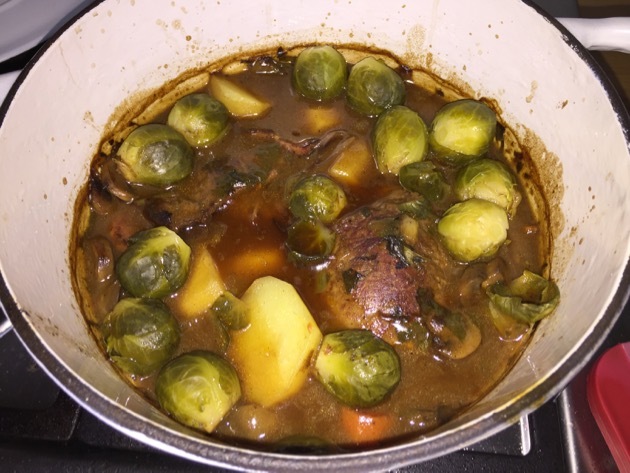 About one hour before you intend eating the meal, add some potatoes and greens so it's a one pot meal. I added potatoes and Brussel sprouts. Test taste to see if you need to add a little more seasoning. This is a really delicious meal that will fill you up and make you feel well fed. 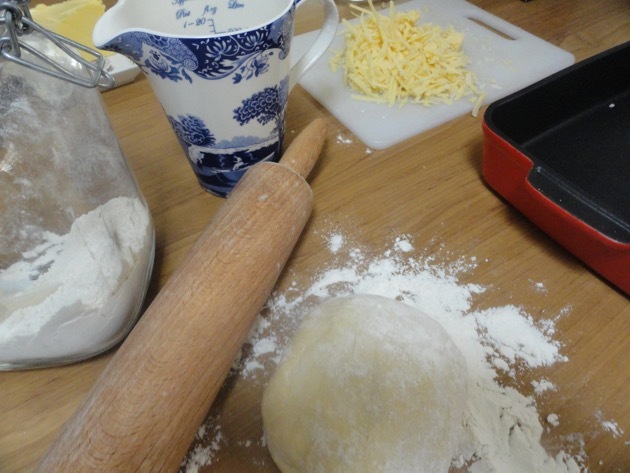 It is good home cooking that is tasty and healthy and you can mix it up depending on what's available in the fridge or garden. Don't forget to remove the toothpicks before serving. I hope you try this, especially if you're having a cold spell where you live. If you give it a go, let me know what you and the family think of it. 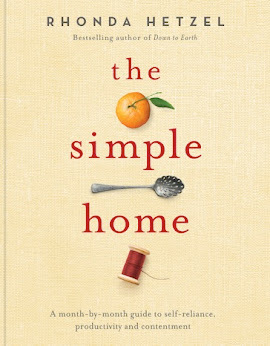 Homemaking attracts people from all walks of life, with differing wants, needs, philosophies and ambitions. I have a degree, a moderate amount of quiet success in small business and, regrettably, a personal history of waste and overspending. 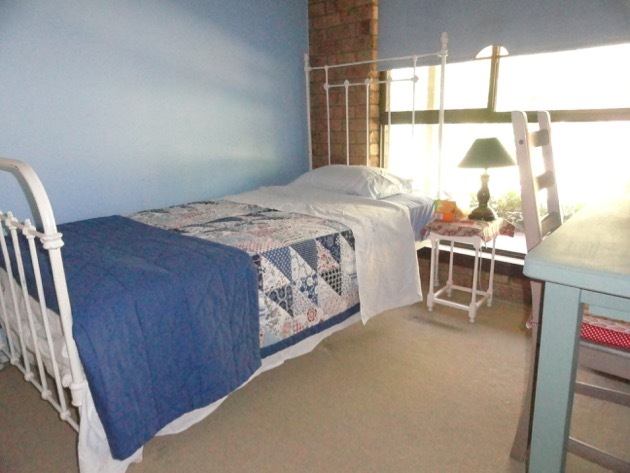 But I had an epiphany of sorts many years ago and since then my aim was to create a safe, comfortable and loving home for Hanno and everyone who visits us here. 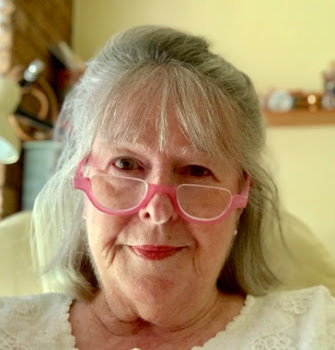 I'm glad I made the changes I did all those years ago because I have grandchildren now and the sense of all we're doing here is crystal clear to me. I think that my history focused me like a laser beam on my home because over spending, waste and living in a disordered home made me unhappy. We only have the pleasure of living in a beautiful and secure home if we put the time and effort in to create it. Nothing is handed to us on a silver platter and most of us have the opportunity to not only work for a living but to also work for the kind of life we want to live. I want to be comfortable and content in my final years, I want an interesting life because I have more time to enjoy my days now and I want to die happy. We all want that, don't we? When I first came home, I wasn't really sure what to do, so I tried to do it all. 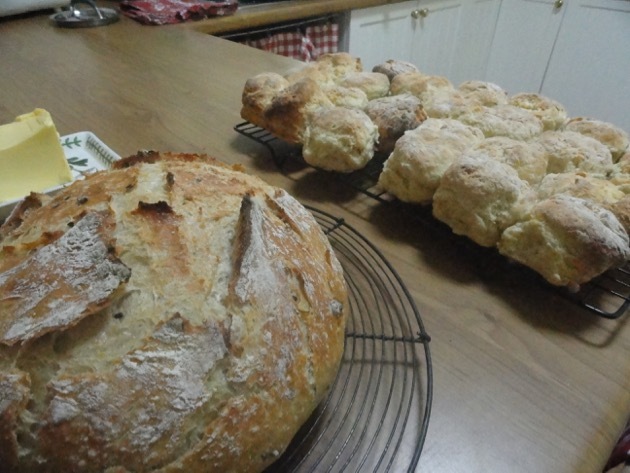 I remembered how things were as I grew up and my days were full of home production, growing food, storing and preserving, mending, creating and serving delicious food in an atmosphere of fluffy, calm comfort. It was very self conscious and focused at first. I've mellowed a lot and relaxed into it now, everything flows and I have much more time to enjoy the process and breathe in fresh air. I smile a lot, especially when no one else is around. I think I'm very fortunate to have had the upbringing I did, the family I have, the education I had and that I took advantage of most of the opportunities that came my way. All that made me the person I am today. But when I look back and see where I've been and where I am now, I am am absolutely convinced that I'm here right now because I changed the way I think about money and possessions. And that is the opposite of what I grew up believing, which was that I, and everyone, were made happy by earning as much money as possible and then spending it on whatever we wanted. I'm happier now than I've ever been and I'm grateful to have learned lessons that were often hidden and not talked about. It takes a bit of digging and self belief, but the truth, your truth, is there. You just have to find it and believe it when you do, because it won't be the truth you expect and it won't be what everyone else is doing. Is your story similar to mine? Do you think you're on that path now?